So a friend flies in from Chicago. Staying in Downtown L.A. You want to impress, so you suggest meeting at the 5-Cent Diner (Also known as the Nickel Diner), which is hipster in the extreme, and is locally famous for its maple-bacon doughnut. It also happens to be tucked into a sad old row of storefronts on tattered Main Street, not far from the worst of Skid Row. It’s just a few doors down from Mission Services, whose front window is papered with the photos of lost or departed neighborhood denizens. Dicey fare, perhaps. But worth it. Especially during daylight hours. Being a second-generation Los Angeleno, I remember when there wasn’t anything downtown but bodegas and tiny shops bursting with Chinese-made tchotckies. There was no reason for anyone who didn’t already live there to be around after dark. That changed when they started turning old factories and office buildings into high-end lofts. But while yes, there are now any number of cool restaurants and cosmopolitan venues (The Edison comes to mind), the efforts to turn Downtown L.A. into a New York City falls short, and in the end simply annoys. 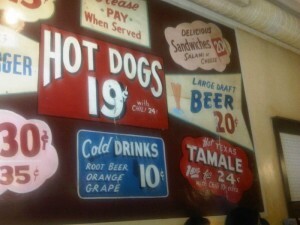 Which is why the Nickel Diner is such a delight. Operating in what was actually once an old-school diner, it’s not trying to be anything it’s not. It’s just updated itself. It neatly straddles both worlds, embodying both the grit of the old ‘hood with the glitz of the new. Which is why you can get your standard greasy diner fare here – eggs, bacon (in many incarnations) and coffee, or eggs and polenta, or eggs “on a bed of buttery leeks.” You can get a Black Cherry Coke or a Pelligrino water. An “Irish car bomb” doughnut or Vegan Coconut Tapioca pudding. But let’s talk about the doughnut. “The Doughnut.” That would be the maple-bacon doughnut this place is known for. We walked in, ordered coffee (which comes in pleasing, venue-appropriate white porcelain mugs), and before we even got our menus, I asked for a maple-bacon doughnut. Turns out they had one left. They go fast, not surprisingly. So we shared. And I inhaled my half a little too quickly for dignity. But I can report that it was a happy experience. All the airy goodness of a freshly-made doughnut with the jarring sweet-and-savory taste of maple glaze and bacon. Oh my God and it was warm. WARM…. 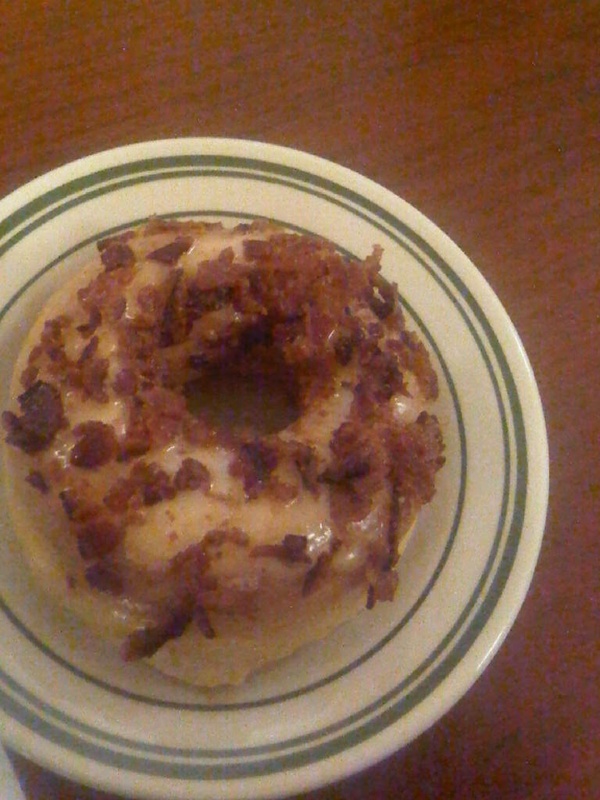 It handily beat out the maple-bacon doughnut I had in San Francisco a few months ago. Hah! Ten points for L.A., yo. OK, perhaps more research is needed. I’m happy to play the Guinea pig. Everything on the menu winked at me. In the end, my friend got the sunny side cup: two eggs baked on polenta with spinach and garlic, topped with Parmesan. I got the polenta with maple syrup and, duh, bacon. Both were excellent, but there were so many tasty things I wanted to try (and we’re not even talking about the pastries…including the home-made Pop-Tart that was howling for my love on a cake tray near the till) that I left feeling like I hadn’t done my due diligence. Will I be coming back to the Nickel? Hell yeah. I might even venture there for dinner. Especially now that daylight hours linger long. When? Serves breakfast, lunch and dinner. Closed Mondays. Tues.Sun. 8 a.m. to 3:30 p.m.
Tues.-Sat. dinner 6 p.m. to 11 p.m.